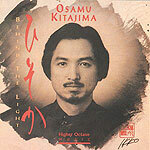 CD review: "Behind the Light"
New Age keyboard artist Osamu Kitajima's new release, "Behind the Light," is at times engaging, has an Eastern sound and approach reflective of his heritage, but is dragged down by its ponderousness and pomposity. Like much New Age music, this album is fairly repetitive, full of grandiose, sweeping passages that fail to excite, and is longer on aspiration than inspiration. There isn't enough of the good stuff here to outweigh the negatives.